Composed by Johann Sebastian Bach (1685-1750). Arranged by Richard Sayage. Savage Classical Guitar Virtuoso Editions. Unaccompanied Cello Suites for solo classical guitar. Baroque. Book. With standard notation (with fingerings). 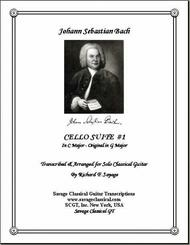 Published by Savage Classical Guitar Transcriptions (SJ.SCGT-0102). BWV 1007 This version is in C Major, the original being in G Major. Finally, an arrangement of the famous Cello Suite 1 for the classical guitar that lies in the hands very nicely, allowing the guitar room to breathe and ring accordingly as this gorgeous music emanates from the instrument.